John McNamara Achievement Award winner is announced at the Hunt Museum – Pictured in front row: model Siobhan Ni Hifearnain, Darren Kennedy, TV Presenter, model Hannah Holden, Michelina Stacpoole, Knitwear Designer, Catherine Bourke, Fiona Whyte, Fashion Designer, winner Jane Eglington, LSAD, Celia Holman Lee, Richard Lynch and Sinead Clohessy, Specsavers Limerick. Picture: Dolf Patijn/ilovelimerick. 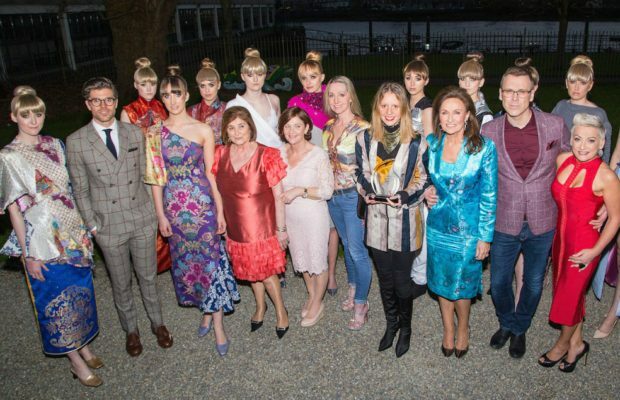 Thursday, April 6, The John McNamara Exhibition, celebrating some of the outstanding fashion creations of the late Limerick fashion designer, was formally opened by Senator Maria Byrne, at a glamorous event at the Hunt Museum and will run for three weeks until Sunday, April 30. The John McNamara Achievement Award trophy was designed by Paul McNamara, the nephew of John McNamara, from an original sketch, John did many years ago. The exhibition was opened with the announcement of the winner of the John McNamara Achievement Award honouring the designs of new fashion designers, sponsored by Specsavers Limerick. The judges were Catherine Bourke who was John’s assistant for almost three decades, knitwear designer Michelina Stacpoole and fashion designer Fiona Whyte. 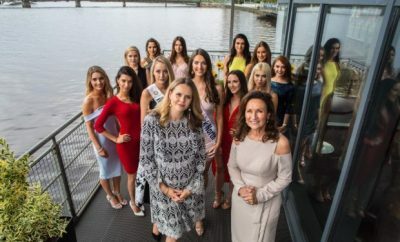 They faced a tough decision trying to choose the winner from the six talented fashion design students attending Limerick School of Art and Design, Limerick College of Further Education, and Mallow School of Fashion and Tailoring. John McNamara, from South Circular Road in Limerick, died in 2015. He graduated in fashion from the Grafton Academy Dublin and Kingston University London and was regarded as one of Ireland’s most talented designers with an eye for glamour and tailoring. John worked with fashion supremo Ib Jorgenson in Dublin for many years, and then returned to his native Limerick where he set up his own workshop. His many clients included President Mary Robinson who commissioned John to design one of her inauguration outfits. 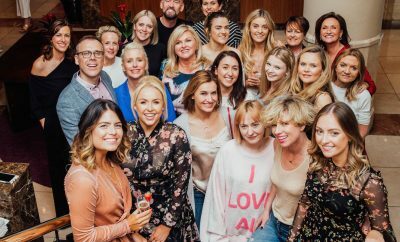 “John was a great supporter of young talent, organising the annual International Colleges’ Fashion event in recent years in Limerick. 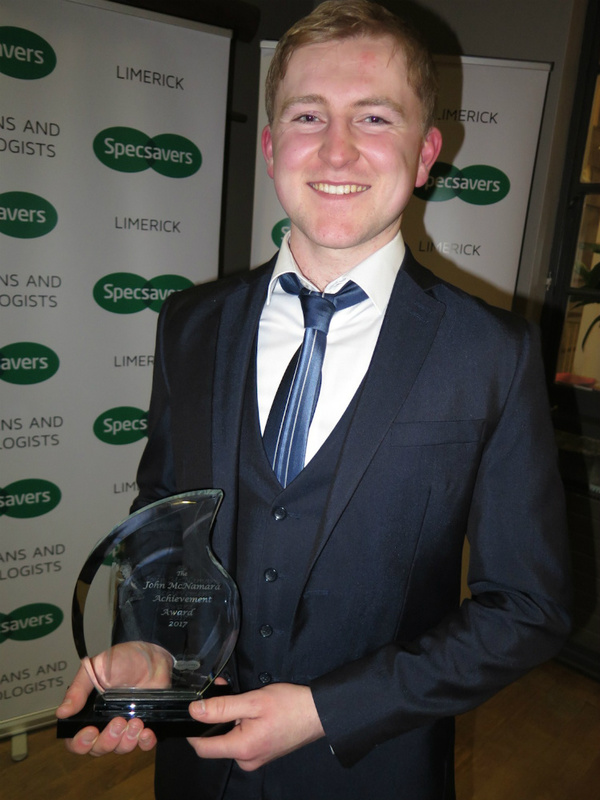 It is a pleasure for Specsavers Limerick to be sponsors of the Achievement Award in his name,” said Sinead Clohessy of Specsavers Limerick. “The exhibition which runs until April 30, will give those attending an idea of the magnificent designs John did for his many clients,” said style queen Celia Holman Lee one of the organisers of the exhibition and one of John’s closest friends. “On display will be examples of wedding and glamorous day and evening wear,” she added. And while some designers may be of the “no pain, no gain” train of thought when it comes to fashion design, it’s refreshingly obvious that John McNamara’s design brilliance came from the fact that his work was more about keeping in tune with his client’s lifestyle needs than just what was in fashion, in any particular season. 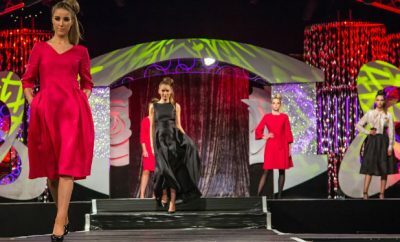 John’s stunning couture garments are a favourite among fashion lovers in Limerick and further afield. The John McNamara Exhibition runs at the Hunt Museum until Sunday, April 30. For further information, contact Naomi O’Nolan, Head of Exhibition and Collection at naomi@huntmuseum.com.